Mix Good People and Good Ice Cream and What Do You Have? A Good Old-Fashioned Ice Cream Social! Time passes so swiftly. We’re so busy with our day-to-day lives that we sometimes don’t even notice how the time flies. But when we pause a bit to consider it, I think we’re often astounded at how rapidly time passes – at least I am! The passage of time is inevitable, though, and always brings changes, both good and bad. One change that the passage of time has brought is most certainly not a good one as far as I’m concerned. Remember the ice cream social? Seems like we used to have them all the time, and now, not so much. But what a delightful tradition that was – and still is. Taking a break from life’s hectic activities just to relax and be with friends on a hot summer’s day. And beating the heat with a treat that’s almost everyone’s favorite, from tiny toddlers to young-at-heart seniors. It’s a tradition that reaches way back into the roots of American culture. We Gather Together… To Eat Ice Cream! America’s love affair with ice cream can be traced back to the birth of our nation. Though at first ice cream was a rare and expensive delicacy accessible only to a privileged few, by the late 1700’s it was becoming available to more common folk. And during the early formative years of our nation, a new type of eatery began to become popular: the ice cream garden. Ice cream gardens offered ice cream and other sweets in a relaxed, outdoor setting – sort of an open-air ice cream parlor. They were a huge hit. People loved the ice cream, of course. But they also enjoyed the informal, neighborly mingling with other folks that the ambiance of the ice cream gardens encouraged. Ice cream gardens were a huge hit for the better part of a century, but by the mid 1800’s they were going out of style as a business model – perhaps because of the seasonal restrictions. But the magical mix of friendly camaraderie and delightfully tasty treats had not gone out of style. People were soon replacing the ice cream gardens with a new custom that offered much the same attraction: the ice cream social. Call me a sentimentalist if you will, but some of the old traditions shouldn’t be abolished by the passage of time. Some are worth making a conscious effort to keep them going. And I think that ice cream socials are one of those grand old traditions that need to be kept alive. Besides – all sentimentality aside – they’re just so much darned fun! 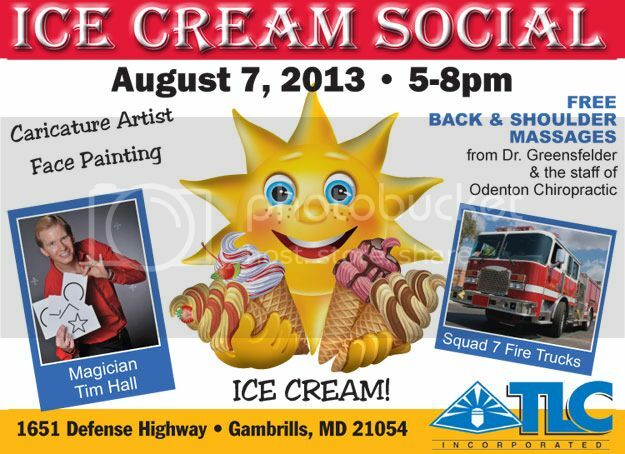 So I’m going to do my part in keeping a grand old tradition going by throwing an ice cream social for all my friends. That means that YOU are invited. Hope to see you! This entry was posted on Monday, July 29th, 2013	at 8:00 am	. You can follow any responses to this entry through the RSS 2.0	feed. Both comments and pings are currently closed.